"Contemporary Orthodontics, 5th edition, is a practical resource with a long tradition of excellence. 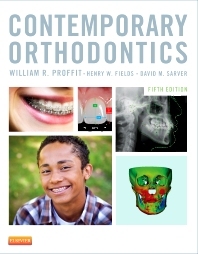 This edition has been extensively revised to maintain the original goal of the book: to provide an up-to-date overview of orthodonitics that is accessible to both undergraduate and postgraduate students and a valuable reference for practitioners...The key elements fundamental in acquiring contemporary orthodontic skills are summarised in a coherent fashion. This text deserves to become the vade mecum for the aspiring orthodonist or clinican." "As has become customary for all of the previous editions, this book represents a valuable teaching resource for all students interested in orthodontics. The previous editions have needed no real introduction, and this edition also adds to the reputation of the authors...A major step forward is the availability of the book and images on the internet...Any student of orthodontics wishing for self-improvement should acquire the latest text. The reader will not be disappointed." "In the latest edition, there are over 200 new illustrations, which include colour photographs, radiographs and colour line drawings and tables. There is also updated material on psychosocial problems in orthodontic treatment, oral function and the relationship between injury and dental disease. Throughout the text there are many illustrated case studies and each chapter is supported by literature references."